Crews were working to get traffic flowing on Wednesday evening after a portion of Interstate 95 was shut down. 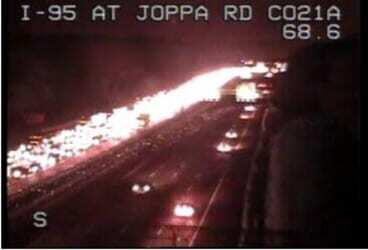 At about 6:30 p.m., the Maryland Transportation Authority said that I-95 was closed in both directions just north of the Route 43 exit due to downed power lines. Traffic began backing up quickly. There has been no update on when I-95 will reopen. Motorists should expect delays and avoid the area.